BROOKHAVEN, Miss. (WJTV) - Brookhaven Police received a call of shots fired around 5:00 a.m. Saturday in the 600 block of North Sixth Street, according to Brookhaven City officials.Once on scene, an exchange of gunfire occurred and Patrolman James White, 35, and Corporal Zach Moak, 31, were shot and killed in the line of duty. Police say both officers are from Brookhaven and have been working for the Brookhaven Police Department since 2015. During the press briefing, Brookhaven Police Kenneth Collins held back tears, describing how officers put their lives on the line every day for their community. "It's just heartbreaking for us to get out here and do our day to day job, and have to face all the things that's against us." He added, "But I promise you, men and women of law enforcement, we're not going to give up. We're not going to stop. This is what we do. We give our lives and service for our community." Suspect, 25-year-old Marquis Aaron Flowers, also from Brookhaven, was also wounded during the gunfire exchange. Flowers was transported to a Jackson hospital with unknown injuries. Several people were also taken into custody this morning for questioning, but no charges have been filed. 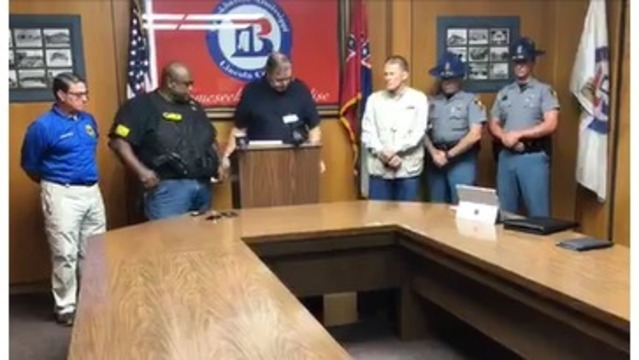 The last officer killed in the line of duty in the area was 18 months ago, and they were from the Lincoln County Sheriff’s Department, according to Mississippi Bureau of Investigations Communications Director Warren Strain.